For other people with the same name, see Roger Craig. Roger Timothy Craig (born July 10, 1960) is a former American football running back in the National Football League (NFL). He played with San Francisco 49ers, Los Angeles Raiders and Minnesota Vikings. Craig went to four Pro Bowls and won three Super Bowls with the 49ers. Craig attended Central High School in Davenport, Iowa, graduating in 1979. There, he was teammates with future NFL TE Jamie Williams. His older brother, Curtis Craig, had also played running back, graduating from Central in 1974. The Craig brothers were preceded at running back for Central by future Denver Broncos RB Jim Jensen. The 1976 team, with Roger Craig and Williams, won the Iowa State Championship under Coach Jim Fox. In 1978, his Senior year, Craig rushed for 1,565 yards and 27 touchdowns, earning prep All-America honors. In his final high school game, a playoff loss, Craig rushed for 353 yards and 4 touchdowns. Craig was an all-around athlete, also competing in wrestling and track. In wrestling, he was an Iowa State Championships qualifier. On the track, Craig finished 2nd in the Iowa State Track and Field Championships in both the 110 hurdles and the 400 hurdles as a Senior in 1979. Craig broke the school record in the 110 hurdles that had been set by Jim Jensen. Craig credited 10-time State Champion Coach Ira Dunsworth with helping develop his distinctive high knee running form. Craig's time of 14.43 in the 110 hurdles is still listed among the All-Time Bests at the Iowa State Track and Field Championships. Craig followed in the footsteps of Curtis Craig and Jamie Williams to graduate from Davenport Central and then attend Nebraska to play for Coach Tom Osborne. Williams went on to an NFL career as well and Curtis Craig was an All-Big 8 Player in 1977. 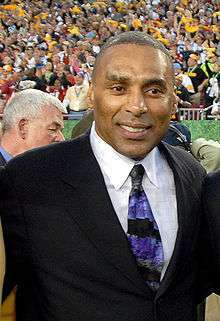 Roger Craig played three full seasons for the University of Nebraska. In his Nebraska career, he rushed for 2,446 yards and 26 touchdowns, with an average of 6 yards per carry. He was an integral running back in Osborne's I-formation option offense. After playing mainly for the Freshman squad in 1979, Craig rushed for 769 yards (7.1) and 15 TD's as a Sophomore in 1980. As a Junior in 1981, Craig gained1,060 yards on 173 carries (6.1) and six TD's. Craig was also fourth on the team with 12 receptions for 87 yards and was named to the All-Big 8 Team. In 1982, teaming with Mike Rozier in the backfield, Craig was injured early in the season and lost playing time while injured, but came back with 127-yards rushing in the regular-season final game. Craig was the 49th overall selection in the 1983 NFL Draft, taken in the second round from Nebraska, where he once held the record for longest run from scrimmage (94 yards, set during a 1981 game against Florida State University). In his rookie year in 1983, he scored a combined 12 touchdowns rushing and receiving, as the 49ers reached the NFC Championship game. Craig became well known in his rookie year for his distinctive high-knee running technique. Craig rushing the ball for the 49ers during Super Bowl XIX. In Super Bowl XIX in January 1985, Craig rushed for 58 yards, caught seven passes for 77 yards, and became the first player ever to score three touchdowns in a Super Bowl during the 49ers' 38–16 victory over the Miami Dolphins. The following season, Craig became the first in NFL history to run and receive for at least 1,000 yards in the same season. He ran for 1,050 yards on 214 carries and led the NFL with 92 catches for 1,016 yards, and scored a team high 15 touchdowns. With fullback Tom Rathman, also from Nebraska, the two formed the 49ers' "Cornfield Backfield." In 1988, Craig was named NFL Offensive Player of the Year by the Associated Press. He ran for a career high 1,502 yards and caught an additional 76 passes for 534 yards. A memorable game occurred in week 7 against the Los Angeles Rams. He scored three rushing touchdowns and ran a career high 191 yards. He went on to assist the 49ers to Super Bowl XXIII by amassing 262 combined rushing and receiving yards and two touchdowns in their two playoff games. In the 49ers' 20-16 win over Cincinnati in that Super Bowl, he rushed for 71 yards and caught eight passes for 101 yards. In the 1989 season, the 49ers advanced to the Super Bowl for the second year in a row, aided by Craig's 1,527 combined rushing/receiving yards and seven touchdowns in the season, along with his 240 combined rushing/receiving yards and two touchdowns in their two playoff games. In San Francisco's 55-10 win over the Denver Broncos in Super Bowl XXIV, Craig rushed for 69 yards, caught five passes for 34 yards, and scored a touchdown. The 49ers were 14–2 in the following regular season on their quest to become the first team to win three consecutive Super Bowls. In the NFC Championship Game (his last as a 49er), Craig fumbled late in the fourth quarter while his team was trying to hold on to a 13–12 lead over the New York Giants. The Giants recovered the ball and scored on a last-second field goal to win 15–13, and went on to win Super Bowl XXV. Craig played a season with the Los Angeles Raiders in 1991 and his final two with the Minnesota Vikings, retiring after the 1993 season. He appeared in the NFL Playoffs every year of his career, and made the Pro Bowl four times (1985, 1987–1989). in 1987, Craig was inducted into the Quad City Sports Hall of Fame. Craig was Inducted into the Davenport Central High School Hall of Honor in 1989. In 1989, Craig became a member of the Des Moines Register's Sunday Register Hall of Fame. and the Nebraska Football Hall of Fame. In 2002, Craig was inducted into the Iowa's IHSAA Football Players’ Hall-of-Fame. His brother, Curtis Craig was inducted in 2003. He was the first running back to gain more than 1,000 yards rushing and 1,000 yards receiving in the same season (1985). Since then, only one other running back has achieved the same feat (Marshall Faulk in 1999). Craig also caught a then-record 92 passes in the 1985 campaign. In 1988, Craig set a then-franchise record 1,502 yards rushing (Garrison Hearst broke the record with 1,570 yards in 1998. Frank Gore holds the current record with 1,695 yards in 2006). The 1988 season was the second time Craig broke the 2,000 combined yardage mark in his career. Craig finished his eleven NFL seasons with 8,189 rushing yards, 566 receptions for 4,911 receiving yards, and three kickoff returns for 43 yards. Overall, he amassed 13,143 total yards and scored 73 touchdowns (56 rushing and 17 receiving). As of today, Lydell Mitchell, Roger Craig and Chuck Foreman are the only running backs to lead the NFL in receptions for a single season, and Craig is the only back to ever record over 100 receiving yards in a Super Bowl. His prowess as a receiver out of the backfield is a contrast to his college career, where he caught only 16 passes during his three seasons at Nebraska. In 1993, Peter King (in Inside the Helmet) reported that Craig was the only running back to be elected to the Pro Bowl at both fullback and halfback. On April 21, 2008 Craig was inducted into the Bay Area Sports Hall of Fame (BASHOF). For the first time since being eligible in 1999, Craig was named one of 25 semifinalists considered for the Pro Football Hall of Fame’s Class of 2009 and one of the 15 modern-era finalists for the Class of 2010. Craig spent several years studying Tae Kwon Do under Chris Jensen and Debbie Pederson at Golden State Tae Kwon Do in Foster City (now in San Carlos). He is an avid runner and has participated in over 38 marathons and half-marathons. He was the Grand Marshal for the Toyota/Save Mart 350 at Infineon Raceway. ↑ "Roger Craig". Pro-Football-Reference.com. Retrieved 8 August 2012. Wikimedia Commons has media related to Roger Craig.